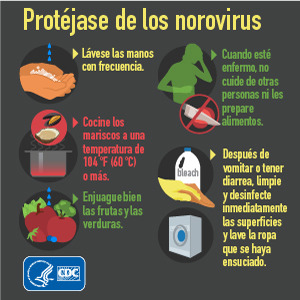 Norovirus is a highly contagious virus and the leading cause of illness (commonly called the "stomach flu") in the United States. Anyone can get infected with this virus and get sick. 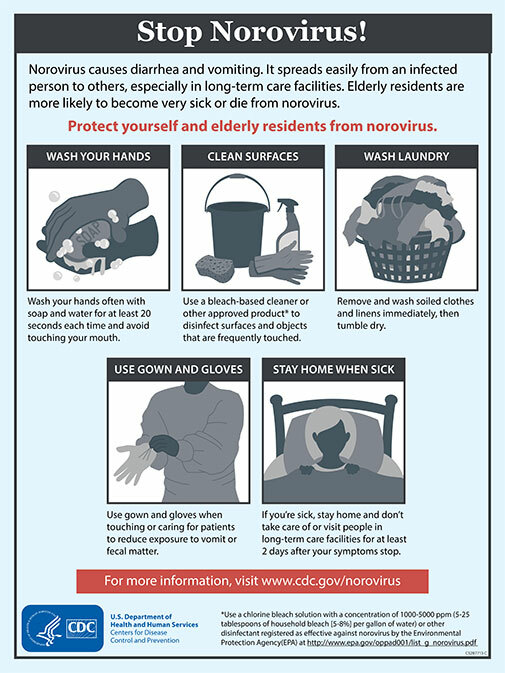 Some people who are infected with the virus do not have any symptoms at all. For most people who get ill, the symptoms are minor, lasting only a few days. 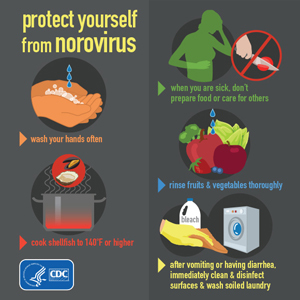 However, Norovirus can cause a more serious life-threatening illness for those who are particularly at risk. Symptoms will appear within two days after exposure. Most will recover within 1-3 days after symptoms appear. Common symptoms include nausea, vomiting, diarrhea, stomach cramps, headache and/or a fever. Severe symptoms caused by dehydration include decreased urination, dry mouth and throat, and/or feeling dizzy when standing up. Eating food or drinking liquids that are contaminated. Touching contaminated surfaces and putting your fingers in your mouth. Close personal contact with someone that is infected. Clean contaminated surfaces with a bleach product or bleach solution (use a solution made with 5 tablespoons to 1.5 cups of household bleach per 1 gallon of water. Be sure to leave the cleaning solution or product on the surface for 10-20 minutes. Rinse the area with clean water after disinfecting.) Workplaces, such as schools, hospitals, hotels, clinics, and restaurants should follow their own specific regulations and guidelines around selecting which cleaning products to use. Drink plenty of fluids (water and electrolytes) as diarrhea and vomiting will cause fluid loss and dehydration. If symptoms worsen, where you become weak or unable to drink fluids, seek immediate medical care. Antibiotics are only helpful in cases of bacterial GI illness. Outbreaks must be reported immediately to the Yolo County Health and Human Services Agency.